The following is part one of an interview with Scott S. Elliott, who is assistant professor in the Philosophy and Religion department at Adrian College, with a specialty in Biblical Studies. His books include, Reconfiguring Mark’s Jesus: Narrative Criticism After Poststructuralism, (2011) Ideology, Culture and Translation, (2012) edited with Roland Boer, and Reinventing Religious Studies: Key Writings in the History of a Discipline, (2013) of which he is the editor. 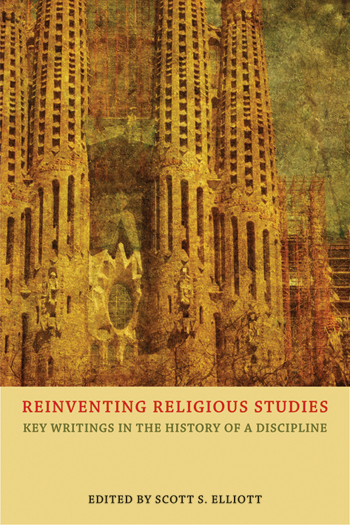 Matt Sheedy: In his retrospective essay that begins this volume, “For such a time as this: the Council of Societies for the Study of Religion, 1969-2009,” Harold Remus notes how the Council on the Study of Religion was formed in 1969, which created an alliance between six different societies in order to provide a “unified concept” for the study of religion and to help replace “confessional” and “ecumenical” approaches that dominated the field at that time. Could you speak a little on this history and on the legacy of the Council for the study of religion today? Scott Elliott: First, let me say thanks for offering me the opportunity to write a bit more about this volume. It’s a book that was intended to both capture and extend a broad and long-running conversation, and I take this interview as an indication that the book hasn’t altogether missed its mark. A great deal of credit goes to Harold for the opening essay. It anchors and frames the chapters that follow it in a way that is integral to understanding them and their contexts. I think Harold’s essay and the articles themselves reflect well the desire and effort on the part of constituent members of the Council to find a “unified concept” for the study of religion and to shake off the constraints of “confessional” and “ecumenical” approaches to the subject. However, they also reflect the nearly insurmountable challenges of successfully doing so fully, not only because any “unified concept” proves immensely elusive, but the very notion of a “unified concept” seems to possess a sort of “theological” residue, reminiscent of the phenomenological approach to religion and of the History of Religions school of thought. What the Council was at its inception is not, in my opinion, what it ultimately became. In fact, the Council already looked remarkably different when I first began reading the Bulletin as a grad student. There were, no doubt, a variety of factors contributing to this, for example, the make-up of the constituent member societies, changes in the field (e.g., the influx of social-scientific theories and methods), and so on. The disbanding of the Council, though unfortunate in some respects, is not an altogether bad thing. In so far as the council engendered a certain sort of collaboration and conversation at a particular moment in the field’s history, it seemed almost inevitable that it would eventually run its course. As to its legacy, I think the Council was, in many respects, ahead of its time, and that few corners of the field embodied what it aimed to be, though there’s renewed movement in that direction now. I see it most in the emphasis on interdisciplinarity and collaboration, and the attention given to the discourse of religion over matters of content. What the Council did, in my opinion, was lay the groundwork for engaging religion (and its interpreters) in and as discourse, inseparable from so many other social, cultural, and ideological discourses, rather than as an isolated, sui generis phenomenon. MS: In your introduction you note that this volume is less about religion and more about those in the field who occupy it. (xiv) Among other things, you suggest that Bulletin articles aim to facilitate dialog and conversation, as well as delve into questions of method and theory, theory and practice, research and instruction, while interrogating the lines between academia and the “real world.” You also point out that these articles highlight some of the main issues in the field throughout the 60s, 70s, 80s, and 90s and are arranged chronologically in order to show “recurrence, development and change.” (xii) Could you discuss what some of these main issues are and what topics were left out for reasons of space? SE: As I note in the Introduction, my training is in Biblical Studies. While that corner of the field is still overwhelmingly dominated by the standard fare of 19th- and 20th-century historical criticism, there are strong trends in other directions and a rising chorus of voices calling for a restructuring of the discipline. Not only is far greater attention being given to politics and ideology, gender and sexuality, identity and social location, etc. ; there is also a growing frustration on the part of many with the obsessiveness of biblical scholars who continue to obsess over such a small scrap of text (relatively speaking). This persistence, in fact, reminds me of the classic piece by Jonathan Z. Smith, “Sacred Persistence: Toward a Redescription of Canon,” which I love so much. It once again points up the lingering theological disposition inherent in our discipline. In any case, this is leading many to reconsider the Bible in relation to secularism (see e.g., Roland Boer, Rescuing the Bible [Blackwell 2007] and Secularism and Biblical Studies [Equinox 2010]), and others to invest more scholarly energy into reception studies, looking less at the Bible itself and more at the myriad ways that the Bible has been interpreted, co-opted, and rewritten in virtually every area of human society, especially in the west. In compiling this volume, what I saw over and again was an obsession with definition (what is religion?) and with method and theory (how do we study and explain it?). As I’m sure you can imagine, reading through four decades of this was, at times, quite tedious. To be sure, I think definition, method, and theory matter greatly. But there is an odd sense that if we could just speak with enough scientific precision and exercise proper clinical care, then we’d figure it out once and for all. This is the same notion that, for the longest time, served as the driving force among biblical scholars. Fortunately, concern over definition is waning, and the interest in method and theory has shifted in its orientation and practices. Thanks in large part to groups like NAASR, more religious studies scholars are thinking with critical theory rather than attempting only to properly apply theory in a methodical (often mechanical) way in order to catalog data. Although sections of the volume are given to the identity crises in the field of religious studies, and to teaching religion, I would have liked to include more on both. One thing I learned very early on teaching undergraduates is that some of the fiercest debates most central to scholars are completely lost on students who are altogether unable to see, much less appreciate, what’s at stake in them. Granted, part of our job is to help students see what matters and why. By the same token, however, the vast majority of students we teach in our proverbial “bread and butter” courses (e.g., Introduction to Religion and the like) will never even be religion majors, let alone professional scholars of religion. We all recognize this, I think; yet we persist in indoctrinating these students into an academic discourse defined and punctuated by issues deemed important, but only by virtue of the discourse that engenders them. It is essential that we continually seek ways to move outside and beyond this. This entry was posted in Politics and Religion, Religion and Society, Religion and Theory, Theory and Method, Uncategorized and tagged biblical studies, Council on the Study of Religion, Critical Theory, Gender, Harold Remus, Jonathan Z. Smith, NAASR, Roland Boer, Scott S. Elliott, secularism, sui generis. Bookmark the permalink.